Specify color glazing to your exact recommendations and vision. Order your glass sample. Go from plain glazing to simply amazing. See how other architects and designers are rethinking colored glass. Vanceva® lights the way to a grand entrance. 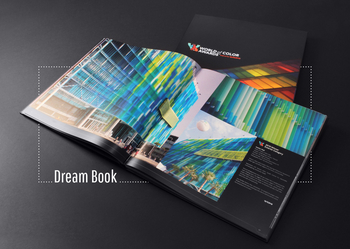 Get inspired by Vanceva Color Interlayers. Color is so important to architectural design. Colors can stimulate or relax us, conveying messages and moods alike. Now there’s an easy way to saturate your designs and showcase your brilliance. Welcome to a new world of color. Welcome to Vanceva! Achieve the right level of translucency with the Vanceva White Collection. Select from a range of 11 Earth Tones in shades of blue, grey, green, brown, and bronze—colors that are all similar to industry standard glass tints. First, there was light. Now, there is color. With Vanceva® color PVB interlayers, you can showcase your glazing designs in a whole spectrum of choices. And by doing so, you add more than color to glass. You give your project brilliance, beauty, wonder, and utility—all the qualities color glazing imparts to inspired architecture. With Vanceva, architects and designers are featuring glass like never before—combining color interlayers to produce more than 17,000 transparent, translucent, or opaque colors that create just the right look and ambience. In fact, no other PVB interlayer offers the range for colored laminated glass that Vanceva does. Vanceva brings a whole new aesthetic to both interior and exterior applications, including balconies, curtain walls, atriums, skylights, partitions, conference rooms, and glass doors. Choose from an array of colors or create your own. Order your inspiring catalog now. Built to inspire. Admired around the world. See how other architects, interior designers, glass fabricators, and glazing engineers are using Vanceva to achieve alluring results.